The XstamperVX line of pre-inked laser engraved rubber stamps are a great cost-effective solution to your modern office needs. They are an Xstamper product so you know you can trust the craftsmanship and quality. Recommended Uses: Return Address or Message Stamping. 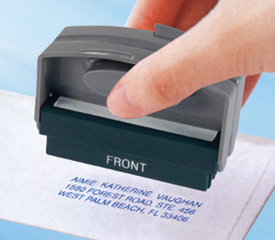 Recommended Uses: Small Return Address, Small Messaging or Notary Stamping.